The Sendak Effect: Or, Move to New York Already! – WILD THINGS! The Sendak Effect: Or, Move to New York Already! If beginning authors or illustrators are going to get advice from someone already established in the field, how many dared to contact the bonafide master, Maurice Sendak, who started out as a window dresser for FAO Schwartz in New York City and, sadly, passed away two years ago? There are some wonderful stories of those newcomers who were bold enough to do so. One such case is acclaimed author/illustrator Barbara McClintock, pictured right, who told us back in 2010 (when he was still with us), “Maurice Sendak has been extremely generous to many, many young illustrators just starting out. He’s been very kind and caring. I wouldn’t be where I am today, if it wasn’t for him.” Noting the many sides of Sendak, Selma G. Lanes wrote of his fiercer, more opinionated side, too, the one not always so patient with current trends in and attitudes towards children’s literature: “One morning, when a student mentioned a handsomely illustrated version of ‘Snow White,’ which he found admirable, Sendak took exception. 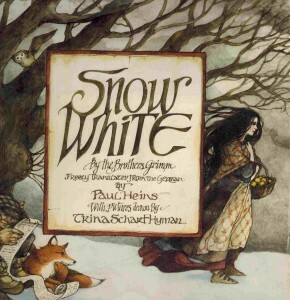 ‘That prince and Snow White are antiseptic, completely bloodless,’ he said. ‘If they get to play Parcheesi on their wedding night, it’ll be a lot. And they’re going to spend the rest of their lives doing greeting cards together,’ he said as a clincher.” (One wonders if he’s discussing Trina Schart Hyman’s 1974 adaptation of Snow White, a retelling with very pale-faced protagonists, indeed, and which lead to a notorious Kirkus review, a story that appears in our book.) However, Lanes went on to note his extreme generosity and gentle nature with the students he instructed in his classrooms at both Yale and Parsons School of Design. A few years before Barbara boldly called Sendak, another young author even more brazenly made his acquaintance with the great illustrator. Picture book writer Arthur Yorinks—already living in New York — read about Sendak in the New York Times and, at the age of sixteen, decided they had too much in common to let a meeting pass. Showing up one day on Sendak’s doorstep, Sendak turned him away but told Arthur he could phone him some time. After much hesitation and many hang-ups, Yorinks finally called and had a lengthy conversation with his literary idol. In fact, Sendak later described to Yorinks the art of Richard Egielski, one of his students of illustration at New York’s Parsons School of Design, telling Yorinks he suspected the two of them would be good picture-book collaborators. The problem was that, at that time, he couldn’t remember Richard’s last name. He gave Arthur a description—and such a glowing recommendation — of Richard, so detailed that, when Arthur later saw Richard on an elevator at Parsons, he knew it had to be the person Sendak has described. 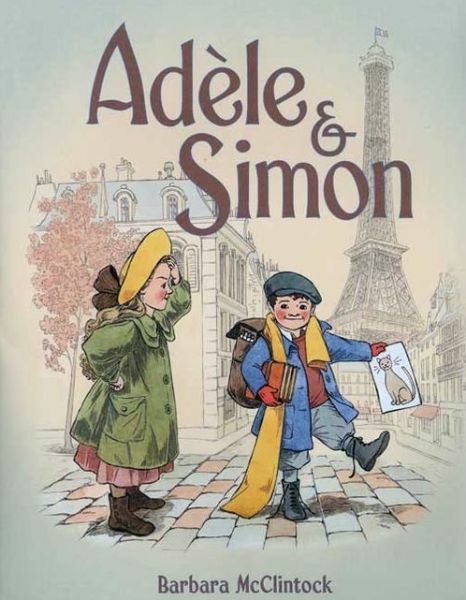 The two began talking, and history was made when they began collaborating on such books as Sid and Sol (1977), the Caldecott-Award-winning Hey, Al (1986), and 1991’s Christmas in July. 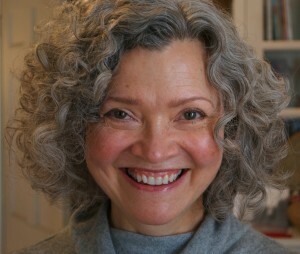 Yet another picture-book creator Sendak reached out to encourage was Harriet Pincus, whom he met while autographing books in a Village book shop. He was so impressed with her talent that he spent hours with her on the phone as well, convincing her to take on some professional assignments as an illustrator. 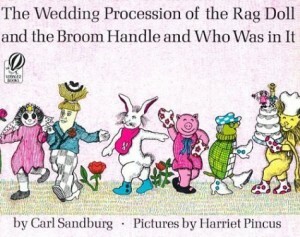 It was with great pride he saw her first illustrated title published in 1967, Carl Sandburg’s The Wedding Procession of the Rag Doll and Broom Handle and Who Was in It. And what was Sendak’s advice to Sís? But of course: “The first thing Sendak told me was to move to New York,” he told Allen Raymond Allen 1997. Sendak was right, Sís added: In 1984, he moved from Los Angeles to New York, jump-starting his career – one that has garnered him the 2012 Hans Christian Andersen Medal, three Caldecott Honors, a 2008 Robert Sibert Medal, countless other awards, and loads of critical acclaim. Last spring, out of the blue, I received an email informing me I was invited to spend a month with Maurice Sendak as part of the inaugural year of a thing called the Sendak Fellowship. My first response was disbelief, and then to wonder who might be playing a joke on me, but early that September I sure enough found myself in Connecticut, sitting next to Maurice Sendak, talking about books. The fellowship was one of those experiences that start out being so astounding one can hardly believe it, and end as something warm and personal and wonderful. Maurice is a funny, generous, brilliant man, who lives deeply. I’m convinced that is the reason his books are so substantial and enduring. What did we do at the fellowship? We mostly worked. I drew, took long walks in the Connecticut woods, drew, wrote, talked to the Fellows, and drew and wrote some more. Kind of what I imagine paradise to be, except it wasn’t in Hawaii. It was particularly wonderful to watch the other artists, Antoinette Portis, Aaron Renier, and Robert Weinstock work. We all had different styles, hours, and approaches, so it was enlightening to observe the many ways those incredibly talented artists come at their work. My time with Maurice will remain the highlight of the experience, though. Thoughtful, passionate, idealistic, he has lived a life of emotional and intellectual honesty and courage. Schmid wrote at his own site a moving post about the fellowship experience after hearing about Sendak’s passing. Last year, 2011 Fellow Sergio Ruzzier also wrote here a tribute and a bit about his experience with Sendak during the fellowship. Designed to nurture the talents of artists who tell stories will illustration, the fellowship grants its recipients five weeks of bucolic isolation, the better to complete their work. … This year, the location of the fellowship will be at another of Sendak’s properties: the 150-acre Scotch Hill Farm in rural Cambridge, N.Y., located about 30 minutes from Manchester, Vt. 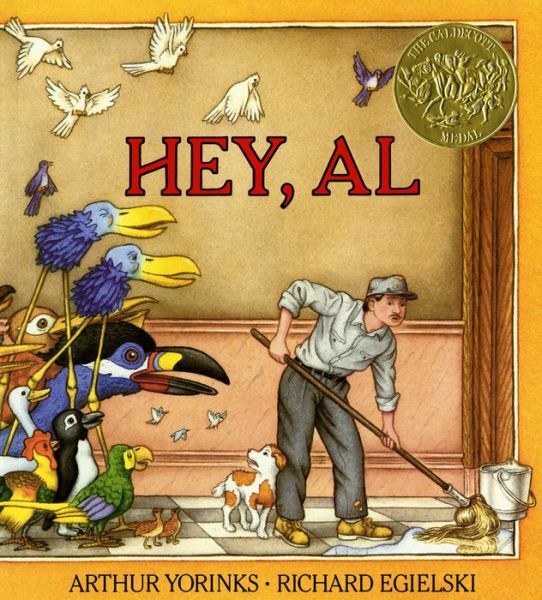 While the field of children’s literature mourns the loss of the great-granddaddy of the modern picture book, we take comfort in knowing that his generosity lives on. Danielson, Julie. “Paul and Petunia Prior to Breakfast (Not to Mention a Sendak Sighting).” Seven Impossible Things Before Breakfast. 8 February 2011. De Seife, Ethan. “Cartoonist Harry Bliss Wins 2014 Maurice Sendak Fellowship.” Seven Days. 17 March 2014. Lanes, Selma G. The Art of Maurice Sendak. New York: Abradale Press/Harry N. Abrams, Inc. 1980. McClintock, Barbara. Phone interview. 12 July 2010. MacPherson, Karen. “Peter Sis to be ‘Read All Over.’” Pittsburgh Post-Gazette. 4 November 2005. Raymond, Allen. “The Creative Magic of Peter Sis.” Teaching Pre K-8. 27.6 (1997): 34-27. Ruzzier, Sergio. “The Sendak Fellowship.” Sergio Ruzzier. 24 February 2013. Schmid, Paul. “Maurice Sendak.” Paul Schmid Studio. 8 May 2012. Photo of Barbara McClintock used with her permission. 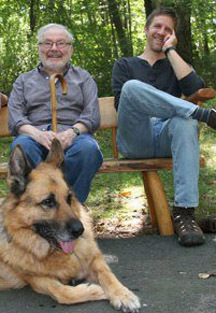 Photo of Sendak and Schmid used with permission of Paul Schmid. 17 Responses to "The Sendak Effect: Or, Move to New York Already!" It’s so nice to have a better sense of Sendak the man. Such good advice. Makes me want to start over again. Or maybe move to New York. 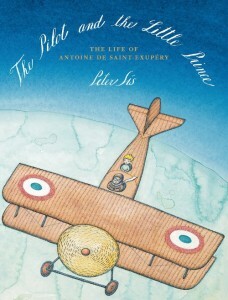 Peter Sis’ animated films are wonderful, too. If I may be so bold, I’ll add another tale of Sendak influence… and that’s mine. Back during my bookselling days at the New York City retailer Books Of Wonder, Maurice Sendak called the store where I worked because he had a question for the owner who was out of town. For reasons I’ll never really know, Mr. Sendak decided to strike up a conversation with me. I suspect it was because he was in an especially sad mood. Shel Silverstein, a regular store customer, had died only about a week beforehand, and even though they did not know each other well Sendak confided in me that with Shel’s passing he now felt as if he was the last of his generation of children’s book creators. Additionally, Sendak’s brother had died about 6 months previously making hime feel especially morose. Regardless, he clearly wanted to talk. And talk with did. For over half an hour we remained on the phone and talked about children’s books. I can’t remember if I ever revealed to him my own aspirations to publish but I do clearly remember one portion of the conversation in which we struggled to find the right word for creating a work worth creating. What makes a children’s book worth creating? “Controversial” was the first word that I offered, but Sendak was right in pointing out that that word connoted a certain political angle that the work didn’t necessarily contain. Also, a good creator isn’t out to offend an audience, but if they are offended then so be it. “Subversive” – that was the word we were looking for. A book worth creating goes out of its way to defy the norms and patterns of both society and all of the books that came before it, something Sendak himself had certainly done many times beforehand. Being “subversive” doesn’t mean being angry or having an intent to undermine the medium. It simply means going out of your way to find a unique way to tell your story while ignoring any perceptions that the establishment might have of how a story should be told. All I can say is that this is the conversation that play in the back of my head every time I sit down to write a new story. I think I might have been in Sendak’s class when the question of a bloodless Snow White came up. 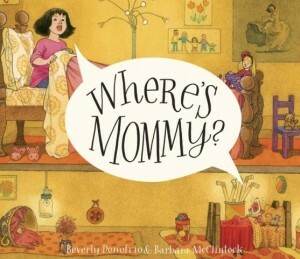 The book in question was a very popular one at the time, illustrated by Nancy Ekholm Burkert (1972). It’s a small point, but you brought back a good memory of Sendak’s vitality even in his disdain. Ah, a mystery solved, Jean! ah, the famous comparison between the two Snow Whites which Perry Nodelman set up for us. The Burkert one got a Caldecott honor, as I recall. Hyman’s did not – they were, truly, ferociously different! There needs to be an Ashley Bryan Fellowship. All of the old guys are going to be gone, and will their genius have been passed on? So glad there was one for Sendak. That’s the best idea I’ve heard in a long time. An Ashley Bryan fellowship. He’s generous about people visiting his studio, but an official one would be so great. Also, I personally love both of those Snow White books, but every single time I read “‘If they get to play Parcheesi on their wedding night, it’ll be a lot,” it makes me snort-laugh. This is such a wonderful idea for a website, and now I REALLY can’t wait to see the book itself! And I’m thrilled and honored to see my work cited in this particular piece. That was back when I was a weekly children’s book columnist for Scripps Howard News Service (The Pittsburgh Post-Gazette was one of our 300-plus weekly newspaper clients). I had that gig for 23 years, and then Scripps Howard News Service died at the end of 2013. So now I’m a blogger (no paywall to worry about anymore) and I still love getting the stories behind the stories when I talk with children’s book creators. 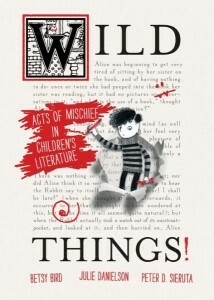 So you can see why I’m ready to read “Wild Things” right now!! Oh, hi Karen! So nice to cyber-meet you. Loved your piece on Sís. I’ll look up your blog for sure! And I’m already a fan of your blog, Julie, and of Betsy’s blog as well. too was lucky enough to have met Maurice Sendak when I got to take his children’s book class at Parsons. He was one of the few teachers there who’d go out of their way to help struggling students. When I told him I was going to drop out of art school and try freelancing, Maurice was delighted! I thought it kind of funny that while all the students were drawing away, Maurice would lecture on things like “a degree in art is completely superfluous, it’s only what you can create on your own that counts.”. One day he brought in the pencil dummy to ‘Outside Over There’. “It looks like an opera!” I commented… and Maurice said I was the 3rd person to have told him that. Of course he lives for Mozart – so that’s not surprising. I also think his fabulous book about children’s book”Caldecott & Company” is almost as good as meeting Maurice himself.